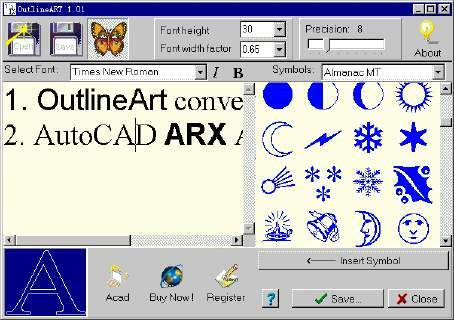 AutoCAD Text Editor - OutlineART,applied in CAD wordprocessing,is a tool to transform words and symbols into DXF format. Main Features Of OutlineART: Inputting words and symbols to be transformed . Opening an existed file . Setting up word attributes You can set up font of words and symbols,wordheight and height/width ratio(DXF only) . Setting up smoothness of vector contour . Saving inputted words to txt file for future use . Saving to DXF file . Easy in use. The trial version of Outline Art can be freely distributed over the internet in an unchaged. OutlineArt. Copyright (C) 2002-2019 DWGTOOL Software. All rights reserved. 1. LICENSE AGREEMENT You should carefully read the following terms and conditions before using this software. Your use of this software indicates your acceptance of this license agreement and warranty. 1.1. DISTRIBUTION This shareware software may be freely distributed, provided that: 1.